Villa Bella is set in an upmarket residential area and can accommodate 8 people. 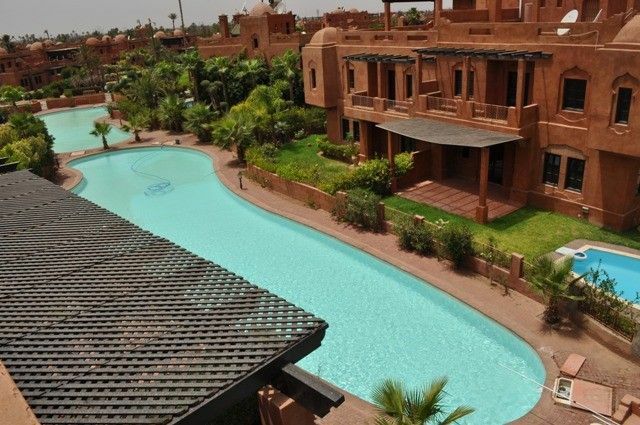 Surrounded by large water features, we are the heart of the Marrakech palm grove. You can reach the three bedrooms on the first floor via an ornate staircase. On your left there is a 50-sq.m suite with a walk-in wardrobe, a bathroom, a shower room, a relaxation area with a plasma TV, and a view of the lagoon. On your right, there is a 30-sq.m bedroom with a bathroom and central bedroom with a shared terrace. In the middle of the 20-sq.m bedroom there is a shower room and a common terrace. * Outside you can find shaded parking for two cars. Our villa is close to all the necessary amenities: restaurants and sports facilities passing by a special children area. The wonderful climate in Marrakech, day and always sunny, invite you to sunbathe and enjoy the water in you private swimming pool or in the lagoon.